Bu makalenin amacı yerel ve global ekonomik politika belirsizliği altında Türkiye’de hisse senedi getirilerinin belirleyicilerinin hangi makroekonomik değişkenler olduğunu ARDL metodu ve 1991-2017 yılları arası dönemde aylık veriler kullanarak belirlemektir. Çalışmada; bağımlı değişken olarak Borsa İstanbul’un BIST100 (BIST) ve Endüstri endeksleri (IND) ve bağımsız değişkenler olarak da Türkiye imalat sanayi endeksi (IPI), reel döviz kuru (RER), tüketici fiyat endeksi (CPI), faiz oranı (R), Türkiye’nin jeopolitik risk endeksi (GPR) ve ABD’nin ekonomik politika belirsizliği (EPU) verilerinden yararlanılmıştır. ARDL tahmin sonuçları, kısa dönemde BIST hisse senedi getirilerinin belirleyicilerinin pozitif olarak IPI, RER ve CPI; negatif olarak da R, EPU ve 2008 global finansal krizini temsil eden “kukla değişkeni” olduğunu ortaya koymaktadır. Uzun dönemde ise IPI, RER ve CPI’daki değişmeler pozitif, EPU’daki değişmeler ise hisse senedi getirilerine negatif etki etmektedir. This paper aims to investigate the short-run and long-run macroeconomic determinants of the Turkish stock returns under the impact of the “domestic and global economic policy uncertainty” by using the ARDL method and the monthly data for the period of 1991:M1 to 2017:M12. The set of macroeconomic variables utilized in the study are the stock market price indexes of Turkey’s BIST100 index (BIST) and the BIST industrial index (IND), industrial production index (IPI), real effective exchange rate (RER), consumer price index (CPI), interest rate (R), Geopolitical risk index for Turkey (GPR) and the Economic Policy Uncertainty index of the United States of America (EPU). The ARDL estimation results reveal that in the short-run the BIST stock returns are positively affected from the changes in IPI, RER and CPI. The effects of the changes in Turkish interest rate (R), EPU and the dummy representing the impact of the 2008 Global Financial Crisis on the stock returns are negative. The long-run determinants of the BIST stock returns are the changes in IPI, RER, and CPI and the EPU. The effect of the changes in the EPU on the stock returns is negative and the effect of the other variables are positive. Abdullah, D.A. and Hayworth, S.C. (1993). Macroeconomics of Stock Price Fluctuations. Quarterly Journal of Business and Economics, 32, 50-67. Aciıkalin, S., Aktas, R., and Unal, S. (2008). Relationships Between Stock Markets And Macroeconomic Variables: An Empirical Analysis of The Istanbul Stock Exchange. Investment Management and Financial Innovations, 5(1), 8-16. Adom, P.K., Bekoe, W. and Akoena, S.K.K., (2012). Modelling Aggregate Domestic Electricity Demand in Ghana: An Autoregressive Distributed Lag Bounds Cointegration Approach. Energy Policy, 42, 530–537. Antonakakis, N., Chatziantoniou, I., and Filis, G., (2013). Dynamic Co-movements of Stock Market Returns, Implied Volatility and Policy Uncertainty. Economic Letters, 120(1), 87–92. Apergis, N.T. (1998). Stock Market Volatility and Deviations from Macroeconomic Fundamentals: Evidence From GARCH And GARCH-X Models. Kredit und Kapital, Heft 3, 400–412. Aydemir, O. and Demirhan, E. (2009). The Relationship Between Stock Prices And Exchange Rates Evidence From Turkey. International Research Journal of Finance and Economics, Issue 23, 207-215. Baker, S., Bloom N., and Davis, S.J., (2016). Measuring Economic Policy Uncertainty. Quarterly Journal of Economics, 131(4), 1593-1636. Baker, S., Bloom, N., Davis, S.J., and Sammon, M., (2018). What Triggers Stock Market Jumps?. Work in progress, presented at Jan. 7th, 2018. Chicagobooth. Balcilar, M., Bonato, M., Demirer, R. and Gupta, R., (2016). Geopolitical Risks and Stock Market Dynamics of the BRICS. Economic Systems, DOI: 10.1016/j.ecosys.2017.05.008. Bayar, Y. and Erem Ceylan, I . (2017). Impact of Macroeconomic Uncertainty on Firm Profitability: A Case of BIST Nonmetallic Mineral Products Sector. Journal of Business Economics and Finance, 6(4), 318-327. Berkman, H., Jacobsen, B., and Lee, J.B., (2011). Time-varying Rare Disaster Risk and Stock Returns. Journal of Financial Economics, 101(2), 313-332. Boudoukh, J., Feldman, R., Kogan, S., and Richardson, M., (2012). Which News Moves Stock Prices? A Textual Analysis. NBER Working Paper No. 18725. Brogaard, J. and Detzel, A., (2015). The Asset-Pricing Implications of Government Economic Policy Uncertainty. Management Science, 61, 3–18. Brooks, C. (2014). Introductory Econometrics for Finance. Cambridge University Press, 3rd Edition. Caldara, D. and Iacoviello, M., (2018). Measuring Geopolitical Risk. FRB International Finance Discussion Paper No. 1222. Available at SSRN. Carney, M., (2016). Uncertainty, the Economy and Policy. Bank of England. Chan, Yue-Cheong and Saffar, Walid and Wei, K.C. John, (2017). How Economic Policy Uncertainty Affects the Cost of Raising Equity Capital: Evidence from Seasoned Equity Offerings. Available at SSRN: https://ssrn.com/abstract=3017843. Chen, N.-F., Roll, R. and Ross, S. A. (1986). Economics Forces And The Stock Market. Journal of Business, 59(3), 383–403. Cutler, D.M., Poterba, J.M. and Summers, L.H., (1989). What Moves Stock Prices?. Journal of Portfolio Management, 15(3), 4-12. Davis, S.J. (2016). An Index of Global Economic Policy Uncertainty. NBER Working Paper No. 22740, http://www.nber.org/papers/w22740. Demir, E., &Ersan, O., (2016). The Impact of Economic Policy Uncertainty on Stock Returns of Turkish Tourism Companies. Current Issues in Tourism, 21(8), 847-855. Duasa, J. (2007). Determinants of Malaysian Trade Balance: An ARDL Bound Testing Approach. Global Economic Review Perspectives on East Asian Economies and Industries, 36(1), 89-102. Engle, Robert F. and Granger, C.W.J. (1987). Co-Integration and Error Correction: Representation, Estimation, and Testing. Econometrica, 55(2), 251-276. Fama, E. F. (1990). Stock Returns, Expected Returns, And Real Activity. The Journal of Finance, 45(4), 1089–108. Gallinger, George W.(1994). Causality Tests of The Real Stock Return‐Real Activity Hypothesis. Journal of Financial Research, 17(2), 271-288. Gjerde, Ø. and Sættem, F. (1999). Causal Relations Among Stock Returns And Macroeconomic Variables In A Small, Open Economy. Journal of International Financial Markets, Institutions and Money, 9(1), 61-74. Humpe, A. and Macmillan, P. (2009). Can Macroeconomic Variables Explain Long-Term Stock Market Movements? A Comparison of the US and Japan. Applied Financial Economics, 19(2), 111-119. Jin, X., Chen, Z. and Yang, X., (2017). Economic Policy Uncertainty and Stock Price Crash Risk. Available at: sfm.finance.nsysu.edu.tw/php/Papers/.../075-1270825538.p..
Johansen,S. (1991). Estimation and Hypothesis Testing of Cointegration Vectors in Gaussian Vector Autoregressive Models. Econometrica, 59(6), 1551-1580. Kumar, N.P. and Padhi, P. (2012). The impact of Macroeconomic Fundamentals on Stock Prices revisited: An Evidence from Indian Data. Munich Personal RePEc Archive MPRA Paper No. 38980, 1-24. Kwon, C.S. and Shin, T.S. (1999). Cointegration And Causality Between Macroeconomic Variables And Stock Market Returns. Global Finance Journal, Vol. 10(1), pp.71-81. Levine, R. and Zervos S. (1998). Stock Markets, Banks, and Economic Growth. The American Economic Review, Vol. 88(3)., pp. 537-558. Mahdavi S. and Sohrabian A. (1991). The Link between the Rate of Growth of Stock Prices and the Rate of Growth of GNP in the United States: A Granger Causality Test. The American Economist, Vol. 35(2), pp. 41-48. Mukherjee, T.K. and Naka, A. (1995). Dynamic Relations between Macroeconomic Variables and the Japanese Stock Market: An Application of a Vector Error Correction Model. Journal of Financial Research, 18(2), 223-237. Naceur, S.B., Ghazouani, S. and Omran, M. (2007). The Determinants Of Stock Market Development In The Middle‐Eastern And North African Region. Managerial Finance, 33(7), 477-489. Nasseh, A.and Strauss, J. (2000). Stock Prices And Domestic And International Macroeconomic Activity: A Cointegration Approach. The Quarterly Review of Economics and Finance, 40(2), 229–245. Niederhoffer, V., (1971). The Analysis of World Events and Stock Prices. The Journal of Business, 44(2), 193-219. Özer, M. (2015). Can Turkey be a Good Example for the Balkan Nations? The Story of Illusion of Well-Being. In Editon of Xavier Richet, Hasan Hanic and Zoran Grubisic, New Economic Policy Reforms, Belgrade Banking Academy, Belgrade, Serbia, 15-58. Pesaran, H. and Shin, Y. (1999). An Autoregressive Distributed Lag Modelling Approach to Cointegration Analysis. In S. Strom (eds.) Econometrics and Economic Theory in the 20th Century: The Ragnar Frisch Centennial Symposium Cambridge University Press. Pesaran, M. H., Shin, Y. and Smith, R. J. (2001). Bounds Testing Approaches to the Analysis of Level Relationships. Journal of Applied Econometrics, 16(3), 289–326. Pradhan, R. P., Arvin, M. B., Samadhan, B., and Taneja, S. (2013). The Impact Of Stock Market Development On Inflation And Economic Growth Of 16 Asian Countries: A Panel VAR Approach. Applied Econometrics and International Development, 13(1), 203–220. Ratanapakorn, O. and Sharma, S. C. (2007). Dynamic Analysis Between The US Stock Returns And The Macroeconomic Variables. Applied Financial Economics, 17(5), 369–377. Roll,R., (1988). R2. Journal of Finance, 43(3), 541–566. Sahu, N. C. and Dhiman, D. H. (2011). Correlation and Causality Between Stock Market and Macro Economic Variables In India: An Empirical Study. International Proceedings of Economics Development and Research, 3, 281–284. Schwert G. W. (1981). The Adjustment of Stock Prices to Information About Inflation. The Journal of Finance, 36(1), 15-29. Schwert G. W. (1990). Stock Returns and Real Activity: A Century of Evidence. The Journal of Finance, XLV(4), 1237-1257. Shahbaz, M., Ahmed, N. and Ali, L. (2008). Stock Market Development and Economic Growth: ARDL Causality in Pakistan. International Research Journal of Finance and Economics, Issue 14, 182-195. Shin, M., Zhang, B., Zhong, M., and Lee, D.J., (2017). Measuring International Uncertainty: the Case of Korea. Finance and Economics Discussion Series, 2017-066. Washington: Board of Governors of the Federal Reserve System. Singh, T., Mehta,S. and Varsha, M. S. (2011). Macroeconomic factors and stock returns: Evidence from Taiwan. Journal of Economics and International Finance, 2(4), 217-227. Şükrüoğlu, D. and Nalin, H.T. (2014). The Macroeconomic Determinants of Stock Market Development in Selected European Countries: Dynamic Panel Data Analysis. International Journal of Economics and Finance, 6(3), 64-71. Tiryaki, A., Erdogan, L. and Ceylan, R., (2017). The Causal Relationship between Selected Macroeconomic Variables and Stock Returns in Turkey. 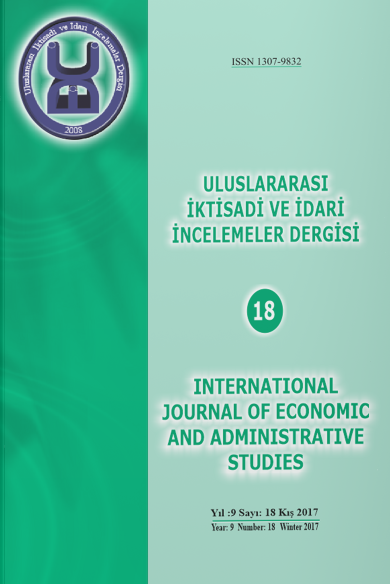 International Journal of Economics and Administrative Studies, Issue 19, 299–326. Tripathy, N., (2011). Causal Relationship between Macro Economic Indicators and Stock Market in India. Asian Journal of Finance & Accounting, 3(1), 208-226. Vazakidis, A. and Adamopoulos, A. (2009). Stock Market Development and Economic Growth. American Journal of Applied Sciences, 6(11), 1932-1940. Yartey, A.C. (2010). The Institutional And Macroeconomic Determinants Of Stock Market Development In Emerging Economies. Applied Financial Economics, 20(21), 1615-1625.